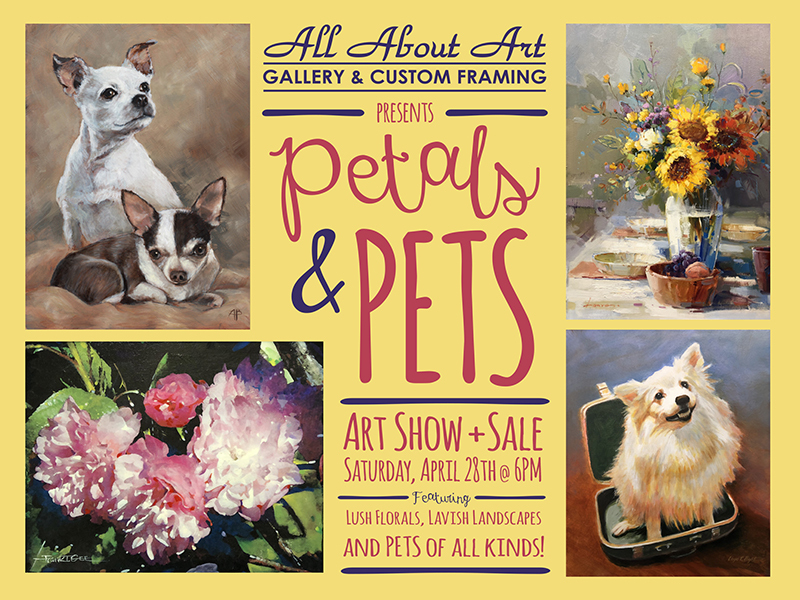 All About Art is proud to announce "Petals & Pets", a themed Art Show + Sale happening Saturday, April 28, 2018 at 6pm! Join us for an evening of art inspired by SPRING! See works of art depicting beautiful flowers, floral rich landscapes - many of which feature local scenery!- and PETS of all kinds by talented local artists such as Adam Baker, Tom Moore, Streater Spencer, Diane Lee, Jade Reynolds, Frank Gee, Joel Knapp, Lloyd Ron Hight, Lorna Sanders, Gayle Levee, Dina D'Argo & MORE! Enjoy a meet & greet with local artists, tasty hors d'oeuvres, delectable libations, live music, door prizes and special sales on everything in the gallery!